Welcome to the South West Region Respite Network. Connecting people, enriching lives and building Resilience. In October 2005 MCYS convened Task Group on Respite Services and Supports for Children and Youth. It was recognized that one of the best ways of supporting children and youth is to protect their families’ resiliency to care for their children and youth. The membership of the group consisted of representation from parents, child welfare, agencies providing services to children with dual diagnosis, coordinated access services, Special Services at Home coordinating agencies, Community Care Access Centres, children’s treatment centres, developmental service providers, respite networks, and Ministries including education, long term care, social services and children and youth services who provided a broad range of perspectives regarding respite. A significant outcome of the task group included a common understanding of how to define respite and a vision for the delivery of respite services in the South West Region. As well, the development of a regional service model consisting of 9 Local Respite Networks (LRNs) was implemented. 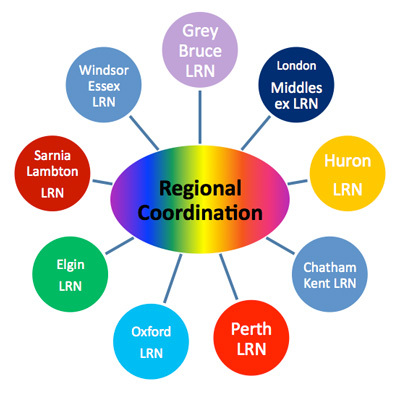 The LRN’s are responsible for the delivery of respite services in the South West Region to children and youth with a diagnosis of Autism Spectrum Disorder. To ensure a comprehensive respite support system the LRNs have representation from respite service providers and community partners specializing in the provision of supports to children and youth with a diagnosis of Autism Spectrum Disorder as well as children and youth with varying abilities and needs. The regional network strives to ensure their services and supports reflect the values and guiding principles defined in the document ‘An Ideal Model for Children and Youth Services in the South West Region -Respite Services and Supports”. Respond to the uniqueness of each community and child on existing services, initiatives and strengths therein. The regional coordinator/network role is responsible, in collaboration with local coordinators/networks for coordination and planning of respite services and supports across the South West Region. ... positive outcomes within the family system are valued whether there is any change in the child's symptoms, behaviour, living situation, educational progress, or legal status. For this perspective, the condition of the child with a mental, emotional, or behavioral disorder can remain static or decline without affecting the value of the family outcomes. What is important is that the family, while maintaining the child in the home and community, can effectively work and thrive as any other family would. Children and youth may have chronic, life-long special needs but by providing respite services to their care-giving families, they are more likely to remain within the family context and closer to the ideal context within which they might reach their potential. Generally the provision of respite services is less costly than the provision of residential care or treatment services. Greater appropriate use of respite services and supports may free up resources currently invested in residential services for strategic and more effective investment in other parts of the children and youth services system.